Order custom bookmarks embossed with your company’s logo to promote your business! You'll be amazed at how affordable this marketing promotion can be when you use cheap bookmark printing. Your customers will be reminded to use your business each time they use their new promotional bookmarks to keep track of where they left off in their favorite novel. The vivid colors make the custom bookmarks hard to misplace and allow your contact information to be easily found. 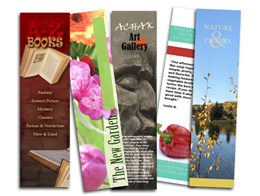 With cheap bookmark printing, promotional bookmarks don't have to break you marketing budget. Simply contact us today to get the best price on cheap bookmark printing. Although cheap bookmark printing will save your company money when compared to more expensive options, these promotional bookmarks don't skimp on quality. Each custom bookmark is made from your choice 14 pt or 16 pt card stock and features a durable UV-Coating on both sides that will provide an extended period of use. Cheap bookmark printing doesn't have to mean it will take forever for your custom bookmarks to arrive. The standard turnaround time for promotional bookmarks is five to seven days, but rush turnaround is also available. At the low price that can be found when you order custom bookmarks, make sure you order plenty. Many customers may want to pick up an extra for friends and family members. You may also want to leave a stack of promotional bookmarks behind when you call on your customers or visit the local library. Before you know it, you'll have your entire town advertising your company through the use of their attractive new custom bookmarks that prominently display your company's information.